Deoprayag Travel Guide, Deoprayag City Travel, Deoprayag Tour Guide, Deoprayag Travel Info, Deoprayag Tour Info, Deoprayag Tour. 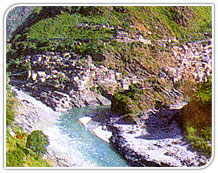 Deo Prayag is situated at an altitude of 618 mts., at the confluence of Alaknanda and Bhagirathi river. It is commonly believed to be the birth Place of Ganga . 70 kms. From Rishikesh on Rishikesh Badri-Kedar route. The famous Raghunath and Shiv temple are situated here.